CLEARWATER, Fla. - Grenny Cumana had a storybook eighth inning in game one of the FSL North division series. With the go-ahead run at second and two outs in the top of the eighth, Stuart Fairchild singled through the left side. Alfredo Rodriguez raced around third as Grenny Cumana fielded and fired. The 5'5" left-fielder delivered a perfect one-hop throw to the plate, nabbing Rodriguez to preserve a six-all tie. 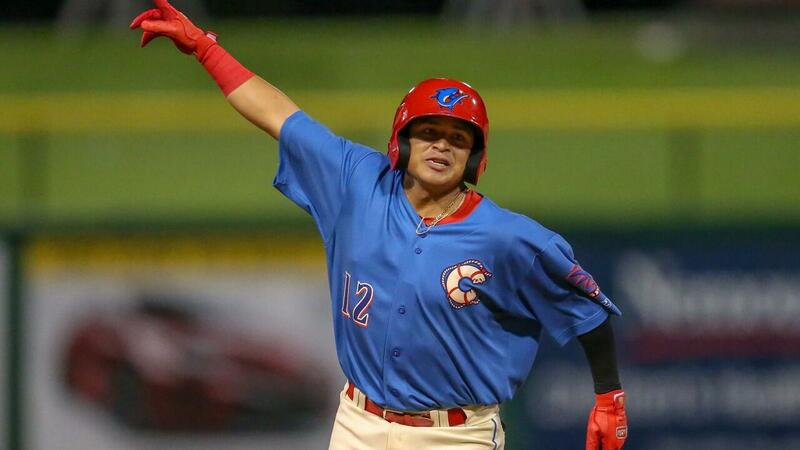 Cumana stepped to the plate to lead off the bottom of the eighth inning, and faced a 1-2 count against reliever Carlos Diaz. On the sixth pitch of the at-bat, Cumana hooked one down the left field line and into the seats to give the Threshers a 7-6 lead. The Threshers hung on to win, 7-6, earning their first playoff win since Clearwater won the Florida State League championship on September 11, 2007. The Threshers will have a chance to clinch a spot in the FSL Championship on Wednesday, with game two taking place at Jackie Robinson Ballpark in Daytona. After Adonis Medina worked a scoreless first on just eight pitches, the Threshers grabbed an early advantage in the bottom half. Daniel Brito got it going with a single up the middle, and Arquimedes Gamboa worked a five-pitch walk. Mickey Moniak was robbed of a hit on a diving play from first baseman Bruce Yari, but that advanced the runners into scoring position. Henri Lartigue got Clearwater on the board, dropping a double to left to plate Brito and Gamboa and give the Threshers a 2-0 lead. After a single from Luke Williams, Edgar Cabral's grounder to third scored Lartigue to push the lead to three. Clearwater grabbed an unearned run in the second to extend the advantage to 4-0. Raul Rivas reached on an error to lead off the inning, stole second, and would score on a two-out RBI single from Gamboa. Daytona cut the deficit in half in the fourth. After Medina struck out the first two batters of the fourth, a Tyler Stephenson single and a two-run shot from Courtney Hawkins brought the Tortugas to within two. The Threshers got those runs back in the bottom half. After a one-out infield hit from Rivas, Kevin Markham ripped a triple to the right field corner to score Rivas, and crossed the plate as well on Brito's single past first that made it 6-2. Daytona closed the gap in the fifth with a Stephenson RBI single, and cut the lead down to one on Taylor Trammell's two-run home run to left. The Tortugas tied it in the eighth on a two-out, RBI double from Alfredo Rodriguez. Stuart Fairchild greeted reliever Addison Russ with a single through the left side, but Cumana came up with a perfect one-hop throw to the plate to nab Rodriguez for the final out of the inning, preserving the tie. Cumana's blast to lead off the bottom of the eighth was the difference-maker, and Russ finished it off by working a perfect ninth inning. Game two of the FSL North Division Series will take place at Jackie Robinson Ballpark in Daytona on Wednesday at 7:05 p.m. Alejandro Requena (4-4, 3.60) gets the nod against left-hander Scott Moss (15-4, 3.68), and the game will be broadcast live on threshersbaseball.com beginning at 6:50 p.m.